We actually care about your success. We get it. Working out consistently is tough and most Chicagoans are busy, lack accountability, and don't have the time to figure out what the they actually need to do at the gym to get into shape. At CPG, we're passionate about showing you a smarter way to train. We've spent the last 5 years developing a fun and progressive program that delivers maximum fat loss and conditioning, while helping you build strength and keep your joints healthy. The Best Value In Chicago guaranteed. CPG’s Team Training classes offer personalized training in a fun and motivating group setting. Our unique four-level training system means you'll learn new skills and be appropriately challenged to get the best results at each step of your journey. If you've ever experienced group fitness classes where everything seems random, no one cares about your needs, and there's no actual coaching - CPG classes are pretty much the opposite of that! Starting as low as $11/class, we proudly claim to be the best value in Chicago. CPG's SPT program offers a 100% individualized training plan built just for you. Whether you're looking to achieve a total body transformation, address chronic pain issues, or hit your first pull-up ever, we partner from the start to build a workable plan to achieve your specific goals. Instead of 1-on-1, SPT sessions happen in groups of (up to) four people, giving you significant hands-on attention with the added support of a small group. Starting at only $45/session, SPT has the benefits of traditional private training for a fraction of the price. Our training program is fun, progressive, and results-driven. You’ll learn how to move safely and effectively with the kettlebell, barbell, sled, and other equipment. Each session is 60 minutes and includes up to 25 participants with two coaches. We believe this structure perfectly balances a group atmosphere with individualized instruction. Have you tried different diets and cleanses without true success? CPG has partnered with the world leader in nutrition and lifestyle transformations: Precision Nutrition. Through PN’s ProCoach software, we’re able to coach CPG members through this world-class year-long curriculum designed to deliver permanent results. We offer completely individualized private, semi-private, and tune-up training packages. 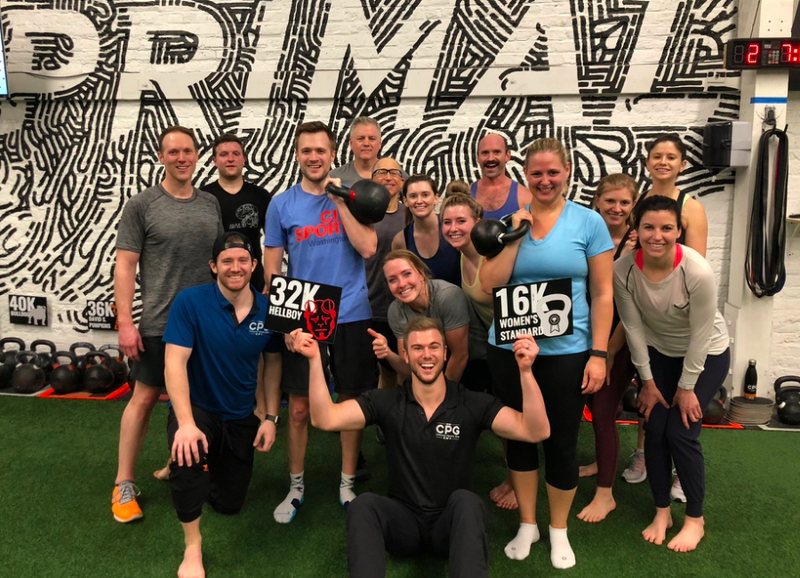 Whether you have more targeted training goals, are battling ongoing injuries/pain, or just want to accelerate your kettlebell skills, our private training options will fast-track your success. We have monthly packages and session packs available. Community plays a key role in a person’s ability to sustain a fitness program. For this reason, we organize many events to help our members have fun and get to know each other. Previous events have included Cubs games, a dodgeball league, open bars, rock climbing, Blackhawks viewing parties, fundraisers, dance parties, and more. Our goal is to help you make friends and actually get excited about coming into CPG! We’ve spent years developing our own assessment system, which measures physical performance across the “Deep 6” kettlebell exercises. Our goal is to provide a clear path to consistent improvement. Members get a chance to “level up” in Kettlebell Mastery multiple times each year. This system is incredibly unique and only available at Chicago Primal Gym. As a member, you’ll receive access to our “Primal People” Facebook group, which is a virtual community centered around health and happiness. You can use this group to ask questions, share recipes, discuss events, or even find a player for your volleyball league. You’ll find that our members are friendly and always willing to help. We believe it’s important to train with a purpose. In addition to our challenges and Kettlebell Mastery System, we offer several opportunities to compete in team events. We’ve been a host facility five times for the Tactical Strength Challenge and had over 30 members conquer the 2018 Chicago Super Spartan Race!